The Bottom Line: What And Who Is The DeepState? 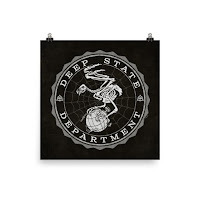 Increasingly, it appears that the political fight isn’t between Republicans and Democrats, but rather it is the American people against an unseen vailed Shadow Government now called the Deep State. More often we are seeing bureaucrats, lobbyists, and elected officials of both parties circle the wagons to prevent any true reforms in our government. Are thy all protecting a Shadow DeepState Government? While we the American people may believe the government isn’t working… for an elite group embedded throughout our government and media, and with another agenda, the government’ is working quite well! But you might say…that’ only seems to describe the expansion of “red tape” that entrepreneurs and individuals complain about, not a group of individuals who seem united to keep government operating as it is currently, and under their control. Isn’t there a difference between red-tape bureaucracy and the Deep State that we’re seeing today? Arguably, yes. But it is the regimentation and red tape that seems to adopt the environment in which the Deep State comes into being and then thrives and controls. “Which human failings will manifest themselves most readily in the administrative machine? Lust for power, automatism, and mental rigidity — all these breed suspicion and intrigue. Being a high civil servant subject’s man to a dangerous temptation, simply because he is a part of the ruling apparatus. He finds himself caught in the strategy complex. The magic of becoming an executive and a strategist provokes long-repressed feelings of omnipotence. A strategist feels like a chess player. He wants to manipulate the world by remote control. Now he can keep others waiting, as he was forced to wait himself in his salad days, and thus he can feel himself superior. He can entrench himself behind his official regulations and responsibilities. Now we see how the Deep State became so deeply entrenched in our government and why its members will fight against any threat to it. The members of the Deep State are fighting for not only their jobs and their power, but their very sense of being. What meaning do they have in life if they were shown that they are in fact dispensable, that they can be replaced or their positions or departments can be eliminated? In the end, their egos depend upon the maintenance and growth of personal power and prestige. And they become easily used by others as well! “The useful idiots” of the Super Elites. Understanding that the fight is not just about power and money, but self-identity and ego, goes a long way into the understanding of how ugly the battle between the American people and the Deep State over the government will become — and how the battle has actually been raging for years. Even as early as just after the first Constitutional Convention. “Compulsive order, red tape, and regulation become more important than freedom and justice, and in the meantime suspicion between management, employees, and subjects increases. That sounds quite a bit like some of the latest intrigues in D.C., does it not? And how about this insight about the politicians who perpetuate and strengthen the Deep State, rather than dismantle it? “Sooner or later nearly all politicians become infected with the bug. Under the burden of their responsibilities, they give in to the desire to play the game of diplomacy. They start to compromise in their thinking, to bend backwards and to be circumspect, lest their remarks be criticized by the higher echelons. Or they fall back into infantile feelings of magic omnipotence. They want to have their fingers in every pie — to the left and to the right. THE BOTTOM LINE: We, the American people, have quite a task ahead of us if we are to seize control of our government out from behind the vail of the Deep State. Over many decades, it has put in place compulsive orders, red tape, and regulations while growing layer upon layer to enforce what it creates. All the while, its roots drive deeper and deeper into our government. Even the politicians who we now send to D.C. to represent us are ensnared in the game. They begin to play by the rules set forth by the Deep State; indeed, our elected officials even become dependent upon the Deep State. It’s just the way it works. And so it is that we face an interlocking defense apparatus that is employed full time by us, using its time to further entrench itself. We support the politicians who promised to take on the Deep State on behalf of their constituents, though not in so many words, will eventually join forces with those who they were supposed to uproot. Right now we are witnessing what happens to those who go against the Status Quo, the DeepState, and the Shadow government that operates behind a vail. They are bullied, smeared and depicted as the bad guy. The Swamp Monsters seem to control everything. But is it posable that the Deep State is not an entity of itself, that there is something bigger and more powerful behind the Deep State? Who are the super elites? The ones that use all the useful idiots in all the Deep State Shadow governments around the world? Without a doubt, the Deep State must be confronted and defeated for the health of our nation. But how? And who? Is’ whomever is behind it all, too big to stop? Is one world government just inevitable? Whether it is or not, it is our responsibility to do whatever is necessary to protect our independence and freedom!